Gone are the days of wandering around aimlessly with a compass, because now, with the best hiking watch, you’ll be able to stay on track using GPS on your wrist. It's easier than calculating routes from the position of the sun, trust us. Hiking watches look like running or smart watches, but as well as time and date they boast a range of other features which make them perfect when venturing into the great outdoors. Here we’ve put together a list of the best for when you set off on your next adventure. A good hiking watch will have an altimeter/barometer and compass as well as GPS. These are the essentials you’ll need when setting off on a long-distance hike. The Garmin Fenix 5 makes our top spot here as it has all of these amazing features as well as incorporating the features of a running watch. You can even track your heart rate so it’s great for fitness tracking too. Another essential to weigh when shopping for the best hiking watch is the battery life, as this will determine how far you can go without needing to recharge. Here, 50-75 hours seems to be the average, but the Suunto Traverse boasts a staggering battery life of 100 hours. The Garmin Fenix 5 really is the all singing all dancing hiking watch right now. From navigation features such as electronic compass, barometer, altimeter and fitness features such as time, pace, laps and calorie counter; it can assist you with just about any kind of activity you’re doing. You’ll get training tips and tricks to show you how to improve your stats and give you insight into your progress, and it’ll do all of that on a high resolution, full colour screen that is easy to see even when you’re out in the sun. With a long battery life and large storage capacity (64MB), this Garmin is the ultimate hiking companion for both short and long trails. The main thing that stands out about this hiking watch is its battery life. With up to 100 hours, you can be sure you won’t be left stranded on a hiking trail without a clue where you are. In fact, this watch not only helps you plan your own trips, but it also features ready-made routes which use topographic maps, giving you all the terrain data you need for hiking. You can save points of interest along your route, and retrace your steps should you need to with the digital compass breadcrumb trail function. For serious hikers, this is one of the best hiking watches on the market right now. An older model of the Fenix 5 (curiously, there is no Fenix 4), the Garmin Fenix 3 is another one for those who lead an active lifestyle but want a watch that can take them from the office to the trail in style. The stainless steel bracelet looks smart and the watch itself boasts a range of features to support your performance in all kinds of activities including running, cycling, swimming, skiing and climbing. When you’re not on an adventure, you can simply use this watch as a smartwatch and the battery will last up to 3 days, and users found the screen to be bright and easy to read whatever the weather. This hiking watch works as an everyday smartwatch and a fitness tracker all in one. you’ll be able to receive messages and calls on your watch as well as upload your fitness data and access training programmes to make the most of your workout or walk. 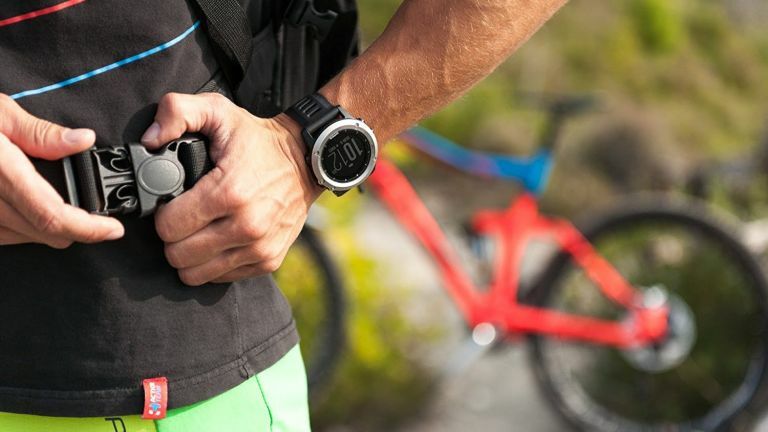 It works with the Suunto Movescount app which is available on both iOS and Android, and you can even take photos and share to social media instantly with this watch. If you’re looking for a smartwatch that you can also take on your hike, this is the one for you. This hiking watch is great for longer walks as you are able to download your route before you leave and use it offline when you’re on the move which will make the battery last longer. It also features latitude and longitude, accelerometer, gyrometer and magnetic compass sensor to help you along the way. It’s compatible with Android 4.3 or later and iOS 9 or later, and you can use the microphone to voice text when on the go. Whether you’re hiking a trail or in the gym, the TomTom adventurer can customise workouts to you so you can track your progress and know what you need to do to improve. It has multi-sports modes with everything from cycling to swimming so you can track your heart rate no matter what activity you’re doing. It’s said to be quick to pick up satellite so you’ll never get lost on route and it’s easy to pair with other devices. A great entry level hiking watch.